Imagine being outside, pregnant, malnourished, searching for shelter, and scrounging for food – then giving birth – and living through this three to four times a year for approximately seven years! This is not a good life for any cat! Amelia was born outside in a neighborhood that struggles with a high population of stray and feral cats. Cats in these situations live very difficult lives outside in cold winter temperatures struggling to find food and shelter. Many cats are malnourished, ill, and injured. She was TNRed (Trap Neuter Return) and has a different story. Trap Neuter Return is a proven solution to cat overpopulation. Stray and feral cats breed at a very high rate. With TNR, cats are trapped, spayed or neutered, and returned to feral cat colonies. This breaks the reproductive cycle for these cats, eliminating the birth of hundreds of kittens year after year. Unfortunately, Amelia did not have a safe place to return to. Enter Tree House Cats at Work – a program that gives displaced feral cats a chance to live out their lives while providing a “green” solution to rodent control. Amelia’s caretaker shared that her yard was overrun with rats. 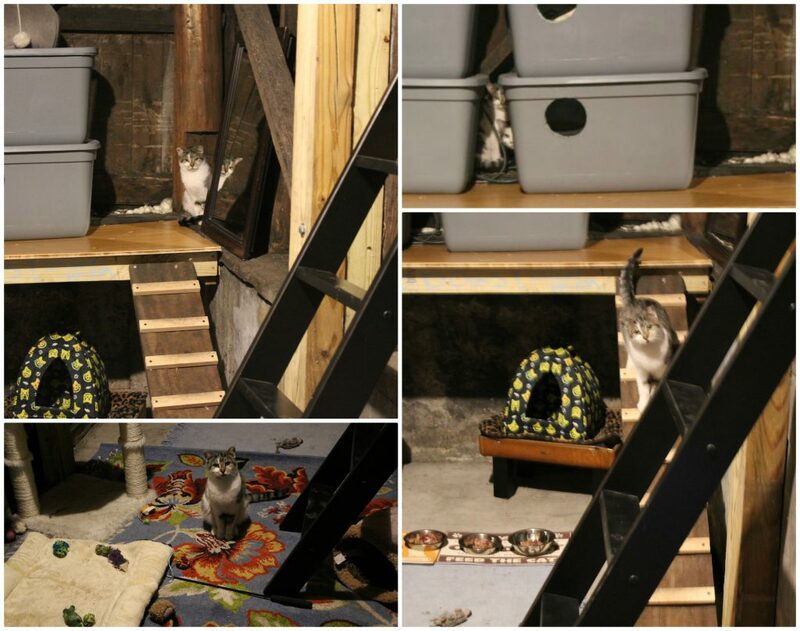 “It was so bad, I had to shuffle my feet so the rats would move when I walked across the backyard to our laundry room.” We placed Amelia, along with several other cats, together. Within a few short months, the rats are all but gone. A cat’s presence alone is often enough to send the rats running. Caretakers for cats in the Cats at Work program provide shelter, daily food and water, and veterinary care for the cats. The cats live in a cat haven – an old carriage stable that was converted to a cat house, complete with perches, a landing, scratching posts, and throw rugs. It stays warm thanks to adjacent rooms that are heated. The cats can come and go through a cat door. A cat like Amelia can begin having kittens at just five months old. Still very young, she would struggle to find food and shelter for herself, let alone to protect and nourish a litter of kittens. She would continue to have litter after litter of homeless kittens. In ten years, a pair of unsterilized stray or feral cats can lead to approximately 57,500 new cats! Give for one spay or neuter surgery. You can help us reduce cat homelessness and give feral cats a better life. Just 15 cents a day or $55 pays for a spay or neuter surgery. We are so excited to be starting the final stages of Tree House’s Cat Cafe Purrfect Roast Catfe. This past summer, we opened the Catfe Lounge to visitors and began serving complimentary coffee and tea. Thanks to everyone who stopped by to visit the cats as well as rate the coffee and tea to help us make menu selections. The Catfe will be fully closed Friday, Feb. 9 at 5:00 pm while we complete construction. We’ll be getting ready for the full Catfe and Lounge opening in the coming weeks. Uniquely located inside Tree House, the Catfe is an extension of our work. As a nonprofit, 100% of the proceeds go directly toward helping save sick, injured, and stray cats. The Catfe will include a full-service counter and barista, free wi-fi, and cats, of course.